The Community Connector bus in Bangor will likely continue Odlin Road service through the end of the year. 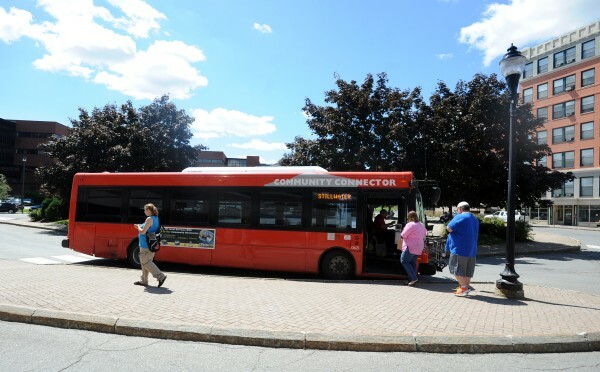 BANGOR, Maine — The Community Connector’s Odlin Road bus route is close to being saved for the year, but a significant loss in revenue expected next year could mean deeper cuts for the bus system. The Bangor City Council is expected to decide this month whether to allocate about $9,000 toward the bus service. Community Connector has that money available in its budget because of delays in the implementation of the Affordable Care Act, according to Assistant City Manager Bob Farrar. That will be joined by another $11,000 raised by community members and businesses to fund the $20,000 route. Pending approval of the $9,000 allocation by the council, the route is safe until June 30, 2014. After that, the city doesn’t know what will happen. Community Connector expects a big revenue slash during the next fiscal year because of a change in the way the state reimburses Penquis — an agency that provides economic and social services to low- and moderate-income individuals — for MaineCare expenses, according to Farrar. That change is expected to reduce the amount of revenue Community Connector receives from Penquis from $409,000 in the last budget year to $205,000 in the next. Bangor would have to come up with about $143,000 to cover those losses, according to Farrar. The city and Community Connector are sorting through the numbers to try to identify new revenue sources or cost reductions before the next budget season so they are better prepared to tackle whatever shortfall faces them, Farrar said. Community Connector targeted the Odlin Road route for elimination after the city asked the bus service to cut $20,000 from its budget. During spring budget talks, the city faced a significant loss of state funding and increasing state and federal mandates. The council told the city to issue across-the-board cuts to departments. The cost of the Odlin Road route, which was the newest and least traveled in the system, just happened to be $20,000, so it was slated for elimination. In the summer, a community effort sparked to save the route and support public transportation. The city set up a fund for donations. In August, Councilor Joe Baldacci volunteered his annual council salary of $2,000 to give the route a few more months. Around the same time, Discovery House, an outpatient center for people recovering from addiction, located along the Odlin Road route, also has offered up to $2,000 to maintain the route. Brent Miller, director of the center, said many of his clients rely on that bus route to get to their treatments on a daily basis. Baldacci then launched a fundraising effort, including a spaghetti supper that brought in about $4,700. “The future of this bus route, that’s going to have to be determined by our future budget,” Baldacci said. “This is going to be a continuing issue, but I’m at least happy that we can continue to fund it through June 30.